Guys, here is a trivia question. Who was the 26th president of the United States? Two hints: teddy bears were named after this dude, and he was probably the coolest cowboy explorer of all time. Theodore Roosevelt! He made the ladies swoon, and the dudes get excited about nature. This Rough Rider was one heck of a guy. Nobel Peace Prize winner, boxer, writer, soldier, at one point even a police commissioner of New York City. What a man! You may not be as prestigious as the old Teddy bear himself, but you can get pretty close. At one point, he said, "Believe you can and you're halfway there." Well, believe you can be just as cool by wearing the Men's Theodore Roosevelt Costume, and trust us you are halfway there. Get up on to your horse, or into your car, and explore in this polyester suit. Get this, it even comes in child size. You could match your kid! Yes, just think of the matching mustaches! The coat has decorative buttons on fully functional pockets to shove more fake mustaches into. You can never have enough fake mustaches! 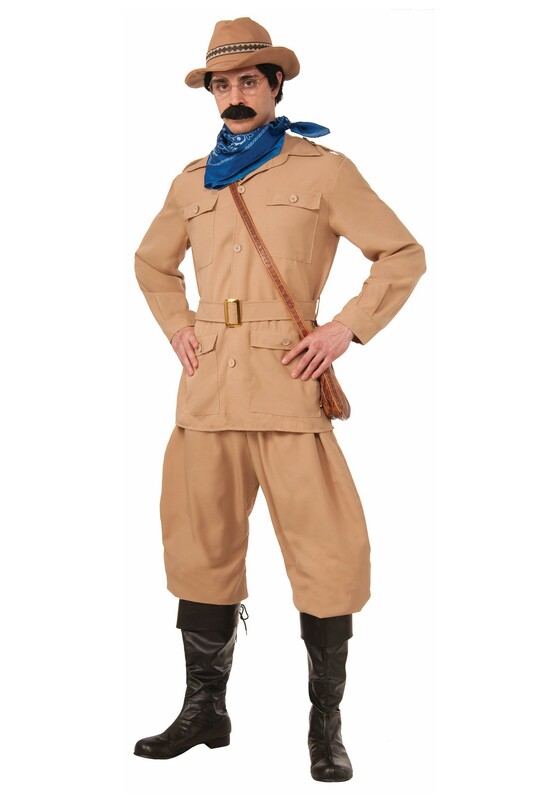 It comes with a fedora with a fierce brocade ribbon band to get you ready for the expedition. Also, the pants have an elastic waist and cuffs, so when you bust a move you don't bust your exploring pants. Just in case you need a little extra pizzazz, the jacket features decorative buttons with Velcro on the back to fasten the front. Get ready, set, and explore like Theodore Roosevelt.